Is this acceptable behaviour by a live act? Having been going to gigs for the last 35 years I can confirm that a typical start time for a headline band hitting the stage has always been 9-9.30. It is only in recent times where the venue intends to have a club-night event in the venue afterwards that they have made a 10pm or 10.30 curfew for live bands resulting in them coming on earlier. And I've just seen that you live just outside Croydon , so until fairly recently transport was still pretty reliable getting home. I went to my first ever paid for gig on a birthday so just coming up to 39 years of going to see bands! Not very often these days admittedly. Even large venues with curfews I’ve been stuck on car parks and not got home to 2am. The more I look at this I think the OP is just trolling. I'm not sure if this is a troll post or not? Most gigs start at around 9pm and finish around 11pm to 11.30pm in my experience. I've been to local gigs 2 nights so far this week, and have struggled to get up for work the following mornings. But that's just the way it is with midweek gigs! In London 7:50 pm is really early. I was a roadie for a European band for a while and in the week they typically went on stage at about 9:00 pm at the earliest or later unless they were doing two sets (rare but it happened at the weekend). The OP is not a troll. I do not like to take a chance on being late for work because I stayed out late the night before. For those that do like to take that risk, maybe you could find another job if you were fired from your current job for poor timekeeping. Also, as I pay for a concert ticket, I feel entitled to expect a level of service in return. I trust none of your gigs have ever been a bit late, then? I agree totally, anyway. It's really inconsiderate of bands and promoters not to organise their tour schedule and running times around your sleep schedule. I don't get the risk element of not getting up in the morning. There are things called alarm clocks that will help you there. If you are worried about not getting up after a couple of hours sleep then just don't go to bed. I've done it many times. The human body is quite resilient and missing sleep for one day doesn't do it any damage. The human body is quite resilient and missing sleep for one day doesn't do it any damage. That is not true at all. Missing sleep can cause early death. Also, I do not appreciate being called a troll. Maybe this forum does not need my continued presence. With that attitude, probably not. OP sounds fun, I’d go to a gig with him. Glad I didn't get involved in this one. From my experience rock bands are late much more often than on time, in contrast with classical concerts which start pretty much on the dot. I sympathise with what you’re saying and in my bands we have always tried very hard to start on the advertised time. And the professional bands and shows I’ve been in have been sticklers for timeliness. Having said that, I make it almost a rule to try never to schedule a start before 21:00. That seems to be the time when audiences are in the best mood for it. You're not a troll. You are however an individual so anally retentive that it'd take seven Customs officials armed with the loader from Aliens to carry out a cavity search properly on you. One has to question who is more sad... the fact that @alnmouth is a bored teenager posting a ridiculous (though amusing thread) or that we’re all commenting on it. Well, in for a penny.. in for a pound. Festival. Share a two man tent. Ffs keep your side clean though, or you'll end up in court! And start on time... or he’ll start a thread about it! We regularly go the SSE in Belfast for gigs. Sometimes they’re bang on 9pm, other times it’s 9.15. No big deal. We also have a 35/40 min drive after the gig is over around 10.30/45 and that’s assuming we can get out of the traffic jams promptly. So, that gets us home between 11.30 and 12 (give or take). AND that includes a school night. As well as getting up at 5am or 5.30am you can be guaranteed one of our 3 kids will waken us during the night. Soooo.... does 15/20/25/30 mins bother me? Not in the slightest. But that’s me. Aside from a band carrying on backstage there are other problems that can lead to a band going on late. You gonna rock out to Little Mix next year? They're playing a Sunday and on a Monday so I'll be giving it a miss. The OP would have appreciated an Isley Brothers gig I went to twenty years or more ago. They were on stage something like 7.00pm and had only done maybe 5 or 6 songs when the drummer fell backwards off the raised podium. Curtain down and gig over. We were all down the pub before 8.15. If only they were all like that, eh? Someone give OP a nappy change. Put him to bed before 7pm. This is the most ludicrous opening post I’ve read in a while, think I need to go for a lie down. The OP aside, I think for me there is a point here. Obviously 7:50 is fine, disregarding that I do think it's unfortunate that often bands don't come on until 10pm. If you stay till the end it's midnight, then you need to get home on top of that. If you've gone to Manchester from Leeds, which I do often, then it's a good hour and a half till I'm in bed. I don't worry about being sacked because of course I'll be up in the morning, but my job is one where I can't be knackered the day after. I have to make serious decisions with repercussions, and I can't do that on 5 hours sleep. This varies from person to person, I know plenty of people who can and do function on 5-6 hours, but personally I can't do it, and professionally I won't put myself in that position. So, yes I often have to leave gigs early, in fact I can't remember the last gig I stayed for the very last tune of. However it's up to the band and the venue, and if I don't like it I will just vote with my feet and not go. Ultimately, it's an annoyance and disappointing if I have to miss the band, but that's part of my career choice. I dont believe OP is a millennial (assuming that’s who you mean by snowflake!). Surely no one under 50 would care for such a live act? I went to see John Martyn in the mid 80s. The support act finished about 8.30pm. Shortly before 10.00pm, a barely able to stand John Martyn came on stage for a very short set. I’d seen him a few times before and was used to his performances being ‘variable’, depending on how pissed/stoned he was - but this was just unacceptable. Imagine you are the band. What time are you going to start your set? Will there be anyone there? And where’s the bass player gone? Goddamn it bass player! The OP is in the audience. He's gonna be soooo pissed. How is anyone going to enjoy our set if we don't start at the advertised time +/-10minutes. 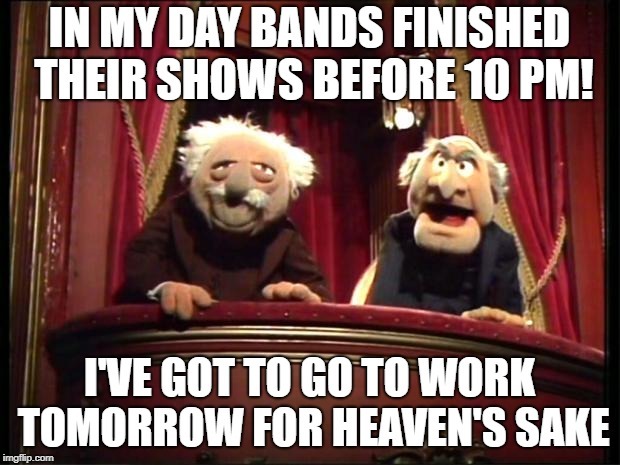 It's the main reason people come to see live music.